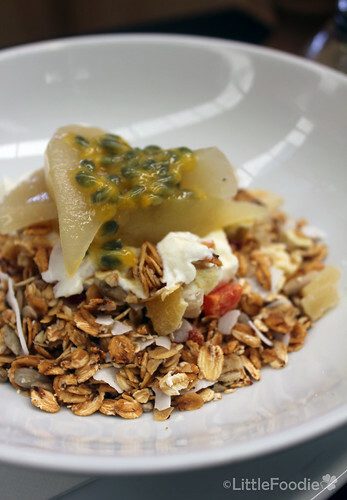 My go to breakfast place in Melbourne has got to be Hobba Coffee + Kitchen. I absolutely now cannot leave the country without dropping by at least once for their slow poached eggs. The eggs are cooked at 62.5 degree celcius resulting in a more translucent and jelly like consistency in the egg white than your typical poached egg. The result is a half cooked and yet solid egg with a yolk that is thick and spreadable. 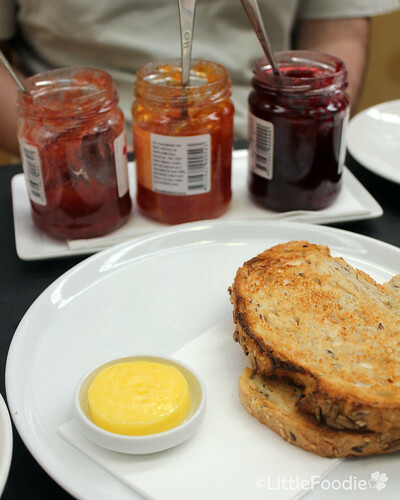 The eggs are delicious on their own or on toast (which come with a selection of spreads). ...or rhubarb on top (the extra fruit is not on the menu description). 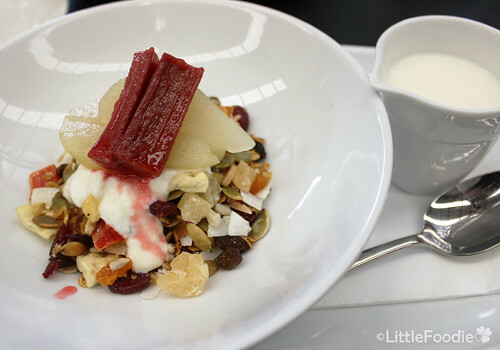 As you can see the oats, nuts to fruit ratio of the muesli was quite different between visits. I'm not sure if this was an adjustment due to customer suggestions or unintentional. But sometimes there are just too much dried fruits. 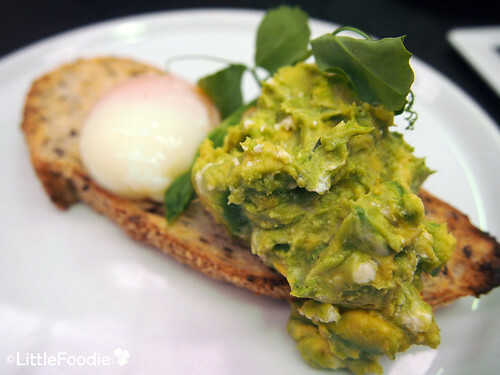 Another healthy alternative is the Smashed avo on sourdough bread which also comes with poached eggs. The avo is prepared with feta resulting in a more creamy consistency than chunky smashed avo dishes at most places. For a heartier breakfast then I recommend the Hobba breakfast (which also comes with the poached eggs). But you get a large grilled Cumberland sausage and thick slice of juicy bacon (non-crispy style). This is quite a large amount of food and the grilled mushroom and tomato completely makes it a balanced meal. The hot chocolates are a bit of hit and miss. During one visit, the first hot chocolate I ordered was perfect. Lightly frothy but thick strong chocolate milk without been overly sweet. Then the second I ordered was like a child’s latte. More milk than anything. We did alert the staff and they quickly remedied the situation. But I've heard from coffee drinkers that sometimes this also happens with the coffee orders - so be warned. As you can see I have only been here for breakfast so I cannot comment on the quality of their lunch. But for breakfast there is no better temple for worshipping the poached egg at its best. 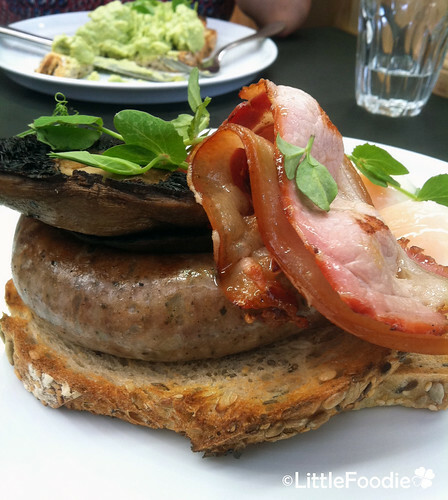 As far as I’m concerned the avocado, bread, sausage and bacon are just garnish to the egg. 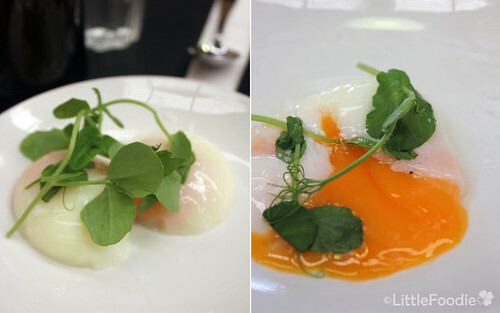 Must try: Slow poached eggs <= plural. Setting: Old car repair convert gives it a warehouse feel. 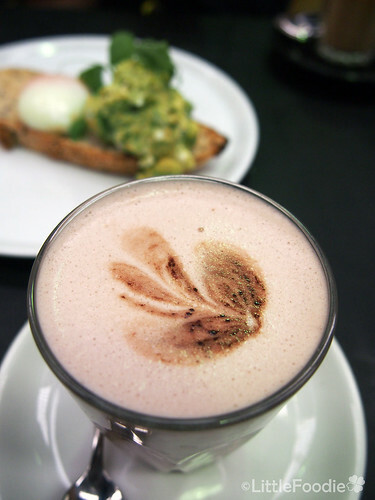 Damage: Breakfast is about $15-20 + $3.5 for hot beverages. 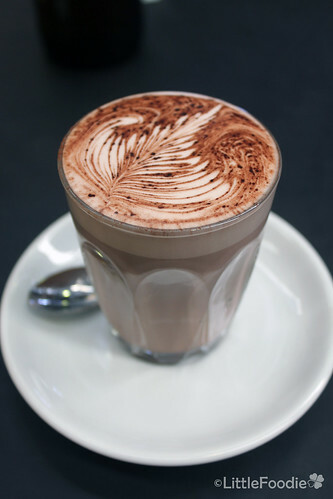 Hot chocolate: 80% of the time really good or else below mediocre. Visit if: you want worship at the temple of poached eggs.